The Crafty Nurse | Just gettin' my craft on! Wow – it’s been almost a year since I’ve posted a card. This is a My Favorite Things inspired card from the Make a Wish card kit. For this Cards in Envy Challenge, we are all about the black and white cards for our “Tuxedo” challenge. Create any black and white themed card for your entry. Our challenge runs through Sunday, January, 28th and the design team will be picking their favorites. As a quick reminder, Cards in Envy asks that you make your card fit into a standard A2 card, which is 4 1/4 x 5 1/2 inches. My card today features an older Stampin’ Up image used with a square scalloped punch. The black and white papers are from My Minds Eye and cut with a Lawn Fawn scalloped die. My script stamp is from Impression Obsessions, which I stamped in Hero Arts Shadow ink in soft granite. I edged in white pen, wrapped the focal in black and white twine, and finished with 3 black pearls. I hope you will join us at Cards in Envy this week and show us your “Tuxedo” cards. Happy Monday! It’s time for a new Cards in Envy Challenge. This week, we are looking for cards that are “Framed with Circles”. Your circles can be stamped, die cut, drawn, or paper pieced, but please add some circles on your card and make sure it fits into an A2 sized envelope. The challenge will run through Sunday, December 31st and our design team will be choosing their favorite cards to feature on The Cards in Envy blog. For my card today I used Lawn Fawns “Snow Day” stamp set. To make the circle frame, I started with a piece of the pattern paper from the Peace, Love and Joy paper pack and chose a Hero Arts Circle infinity die larger than my design paper, creating a “frame”. Once the circle was cut out, it created two pieces that I adhered to my card front. I then took two smaller circle dies taped together onto some red design paper and cut those out which created another frame. I die cut a final circle with green cardstock. For my focal image, I stamped the heart in red and added snowflakes in white. I finished off with a bow and a sentiment from the same set. I’m looking forward to seeing what you come up with this week for your “Framed in Circles” card for the Cards in Envy Challenge! For this Cards in Envy Challenge, we are ringing in the holidays with a “Jingle All The Way” theme. Create a December holiday card using one or more bells. Our challenge runs through Sunday, December 17th and the design team will be picking their favorites. As a quick reminder, Cards in Envy asks that you make your card fit into a standard A2 card, which is 4 1/4 x 5 1/2 inches. My card today features a holiday favorite digital image by Mo Manning called, “Christmas Fairy Holly“, which I colored with Copic Markers. My sentiment is by Hero Arts and I finished off the card with Nuvo Drops in clear. I hope you will join us at Cards in Envy this week and show us your “Jingle All The Way” cards. The Crafty Nurse here today sharing some inspiration using the November release stamp, “Just Wing It”. The background is created using Distress Ink. 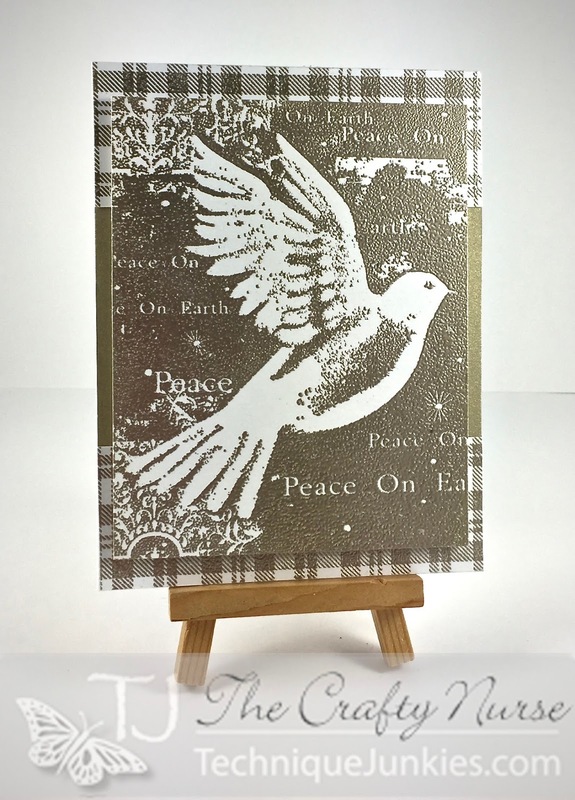 Then I heat embossed my image using white powder over the background using my MISTI. I inked the sentiment with Versafine Black Onyx Ink and embellished the edges with another gorgeous stamp called, “Toile de Jouy Set of 9” using a grey ink. I finished off framing the eyes with some pen work and called her done. I hope you and your family are enjoyed your Thanksgiving weekend and don’t forget to take time this holiday season to get inky! This will be my last post for Technique Junkies, at least for a while as I’m taking a break from the team. The Crafty Nurse here with some mid-week inspiration using a technique called “Pearly Gelato Wash” from Pat’s newsletter pages. 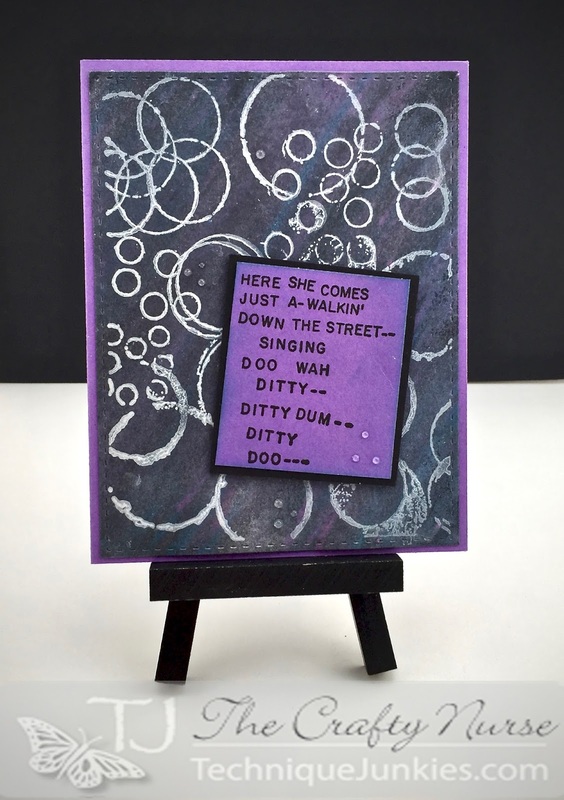 Over the beautiful gelatos background, I stamped “Painted Rings” with Simon Says Stamp white pigment ink. My sentiment is another favorite called, “Doo Wah Ditty”, which I framed with distress ink and backed in black cardstock then finishing off with Clear Nuvo Drops. We’d love to see your cards and projects over at the Facebook Group. For this Cards in Envy Challenge, out theme is “It’s Only Paper”. There should be no stamping or no non-paper embellishments. Our challenge runs through Sunday, December 3rd and the design team will be picking their favorites. As a quick reminder, Cards in Envy asks that you make your card fit into a standard A2 card, which is 4 1/4 x 5 1/2 inches. My card today features design paper from Photoplay called, “Luke 2”. My stars were cut from glitter paper and my letters stacked paper from the Hero Arts alpha dies. I hope you will join us at Cards in Envy this week and show us your “It’s Only Paper” cards. Hello Junkies! I’m here today with a Technique Junkies November release stamp called “Painted Rings” which I painted with Jane Davenports “Mermaid Markers”. Simply stamp and heat emboss the “Painted Rings” with white powder on 140 lb. watercolor paper. To color, use your Mermaid Markers by coloring a heavy line on the bottom of the bubble and feather out with your aqua brush. My focal image is another great stamp called “Typewriter Set”. I also colored this with the Mermaid Markers after stamping and heat embossing over watercolor paper. I hope you find some time to get crafty today. 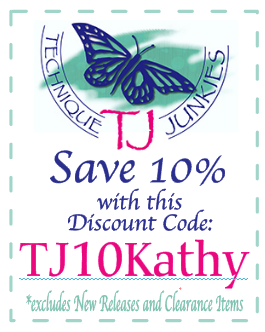 Please join us over at the Technique Junkies Facebook Page, we’d love to see you! The Crafty Nurse here posting one of my all-time favorite holiday stamps for the 25th day of Technique Junkies 30 days of Christmas. Pat is offering 20% off all Christmas stamps during this celebration. This is such an easily reproducible card especially when you use the MISTI. Technique: Heat embossed with Platinum embossing powder by Ranger. We’d love to see you are making for this holiday season over at the Facebook Group.